Connect your Bluetooth capable device to the player wirelessly and listen to your device's audio on the karaoke player speaker. 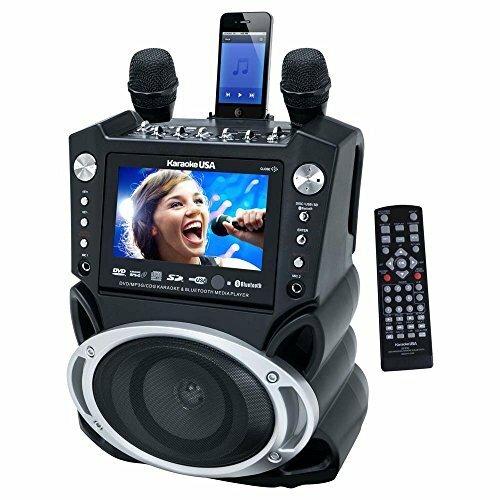 The GF830 is packed with features to keep any karaoke enthusiast busy. A gorgeous 7" TFT color screen allows for easy reading from afar. 300 MP3G songs are included on disc, but if you prefer singing your own favorite hits this system plays any karaoke CDG, DVD Karaoke and also plays DVD movies. An auxiliary input allows for playback from any device with a 3.5mm headphone jack. Rest your personal device in the cradle for charging or watching the screen in an upright position. Record music and your voice onto an SD card in MP3 format from any karaoke source, then play it back or take it with you. If the party isn't stopping use the audio/video outputs for connection to a big screen TV or your home entertainment system.